Ever find yourself asking, "Why can't you sit down while you eat?" or "You used to like this, what's up?!" Take a deep breath. This too shall pass! And knowing why this swing shift in eating habits is happening may take the edge off a bit. If you are a parent, you know how inconsistent young children can be when it comes to eating the food you offer them. One day they love steamed broccoli and chicken and the next, "No thanks!" Some of this fickle nature has to do with the unique stage in their growth and development. There are specific periods of time when their cognitive characteristics impact the relationship that they have with eating and nutrition. Factors such as hunger and satiety, social, familial, and biochemical influences all impact the way your child will relate to their food world. This concept is based on Piaget's Theory of the 4 Stages of Cognitive Development. Jean Piaget was a Swiss born Psychologist who seemed to enter this world ripe with curiosity. A student of his surroundings, he was known for his keen observation that children are not less intelligent than adults, but that they simply think differently. Piaget's cognitive discovery is impressive. Albert Einstein even cites it as "so simple only a genius could have thought of it." 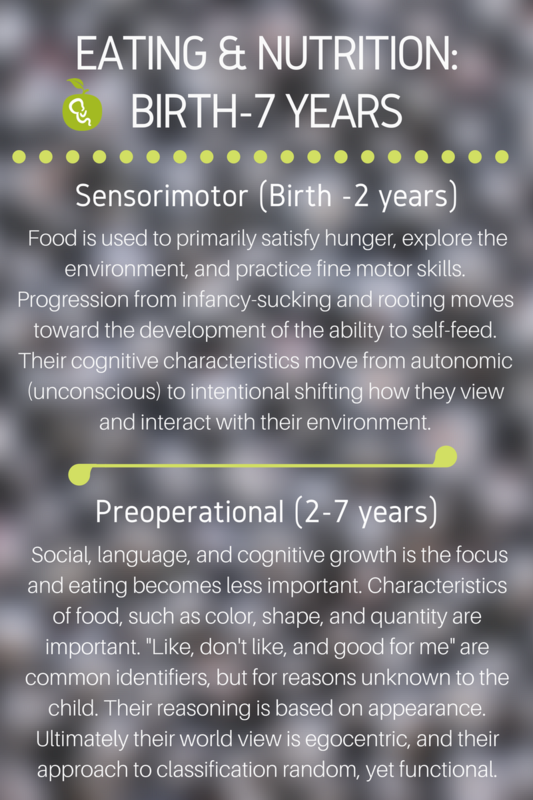 However, the way these cognitive characteristics tie into how a child interacts with their food environment is even more impactful, especially for a frustrated parent. It has alleviated some of the headache that can center around meal-time. As they say, "knowing is half the battle." Here are 2/4 classified developmental periods and how they relate to the relationship your child may have with feeding, eating, and nutrition. Adapted from: Krause's Food and the Nutrition Care Process, Nutrition in Childhood, Feeding, Nutrition, and Piaget's Theory of Cognitive Development, Table 18-2.